Who should you support on this year's All-Star Game Final Vote ballot? The final two spots on the NL and AL All-Star Game rosters are down to 10 men. Cliff Corcoran breaks down the ballot for each league and explains why Brian Dozier and Clayton Kershaw should be your picks. The votes are in, and the All-Star starters, pitchers and reserves have been announced, with far fewer snubs (and Royals) than expected. All that’s left is for the fans to select the last man on each league’s roster via the Final Vote ballot. Here, then, is a look the five players on each league’s ballot, with my pick for the most deserving candidate from each. Players are listed alphabetically. All stats are through Monday's games. The case for Bogaerts is a simple one: He leads all American League shortstops in Wins Above Replacement, besting Jose Iglesias’s 1.7 bWAR by a fair margin. Prior to the Final Vote, both leagues have just two shortstops on their roster. In a perfect world, Bogaerts and Iglesias would be the two on the AL roster, but the #VoteRoyals campaign thrust the undeserving Alcides Escobar into the starting job. AL (and Royals) manager Ned Yost had a chance to include Bogaerts outright, as he needed to select a representative from the last-place Red Sox, but he went with utility man Brock Holt instead. Holt, who his hitting .295/.383/.424, is not an undeserving selection. In fact, both he and Red Sox centerfielder Mookie Betts lead Bogaerts on bWAR (4.1 for Betts, 3.1 for Holt), but neither leads the league at their position, which Bogaerts does. When I broke down the Royals-heavy AL voting last month, I named Cespedes as one of the four most-deserving outfielders in the AL. Since, then, however, Cespedes has hit just .280/.298/.460 to fall back into the pack. That’s a perfect example of why you should wait until the last possible day to vote for the All-Stars. Given the larger sample of his season, it’s not clear that Cespedes deserves to be an All-Star this year, and since he has had a significant presence at the All-Star events the last two years—winning the last two Home Run Derbies and playing the second half of last year’s game, his first—I see little reason to pick him over more the deserving candidates on this ballot. ​Dozier is another victim of the fan vote. Jason Kipnis has clearly been the best second baseman in the majors this season, but the fans elected Jose Altuve, who just edged out Royals prank candidate Omar Infante. Altuve is a legitimate candidate coming off an MVP-quality season, but he was an All-Star last year (and in 2012) and doesn’t necessarily deserve to be one again this year. With Altuve as the starter, however, Kipnis had to be the backup, and with the undeserving Escobar starting at shortstop, the middle-infield bench spots got crowded quick, with Iglesias (via player vote) and Holt (via Yost) edging out Bogaerts and Dozier, all of whom are arguably deserving based on their first-half performances this year. If you use 2014 performance as a tie-breaker, however, of the eight players I just mentioned, only Altuve had a better 2014 than Dozier, who hit 23 home runs, stole 21 bases and was worth 5.2 bWAR. Given that there was legitimately no room for Dozier on the All-Star roster last year (Altuve, Robinson Cano and Ian Kinsler were the deserving second basemen who made it), he, more than Altuve, should get the carry-over honor this year. As Jay Jaffe wrote a week ago, the only active position player to have a higher career WAR total than Gardner but never make an All-Star team is Coco Crisp. That’s not necessarily a reason for him to be on the 2015 All-Star team, but it’s worth noting. In his last three healthy seasons, Gardner has averaged 4.2 bWAR, and he accumulated 7.3 bWAR in the season prior to that. An elite fielder and base runner with on-base ability and surprising pop (17 home runs last year and on a similar pace this year), Gardner is arguably one of the most underrated players in the league, and he currently boasts the highest bWAR of any of the five players on this ballot. He's also the bWAR leader of one of the league’s first-place teams, outpacing his two teammates who have already made the roster, Mark Teixeira (2.6) and Dellin Betances (1.0). Moustakas has had a career-salvaging season, rebounding from a 76 OPS+ over the last two seasons by teaching himself to hit to the opposite field, resulting in a 119 OPS+ this year. He has also improved his play in the field, with the combination of his glove and bat taking him from being a near-replacement-level player to a legitimate All-Star candidate. However, there remains a significant gap between the two deserving third basemen already on the roster—Josh Donaldson and Manny Machado, both having MVP-quality seasons—and Moustakas. At 26, assuming his turn-around can be sustained, Moustakas will have plenty of other opportunities to be an All-Star. Moustakas and Cespedes simply fall short, but Dozier, Bogaerts and Gardner all deserve to be All-Stars this year, making it a shame that only one of them (and potentially none of them, given the likelihood of the Royals' voting base kicking back into gear for Moustakas) will be. With none of the three having made an All-Star team before, sentiment may point toward Gardner, who at 31 is less likely than the 22-year-old Bogaerts or even the 28-year-old Dozier to come this close to an All-Star selection in the future. Still, any of the three would be a fine choice. I favor Dozier largely because he was similarly deserving last year but was legitimately squeezed off the roster. To leave him off again this year because the fans voted in Altuve and Escobar seems cruel. Unlike the AL Final Vote ballot, which is focused on the legitimate snubs among the league’s position players, the NL ballot is a hodgepodge, with four pitchers and a hitter. Three of those five players are superstars whose numbers are down a bit from their spectacular 2014 seasons, and the other two are young pitchers in new roles who would seem to have little hope of competing for votes with the other three. In 2014, the Reds’ ace made his first All-Star team and finished second in the Cy Young voting. Despite chronic injuries in '13, he has legitimately been one of best pitchers in baseball since '11, with his 152 ERA+ over that span ranking second behind only Clayton Kershaw’s 164 among pitchers with 700 or more innings pitched. His underlying performance this year is every bit as good as his '14 season: his Fielding Independent Pitching (3.25) and strikeout-to-walk ratio are actually superior to last year, both marking career bests thanks in part to a career-low 1.7 walks per nine innings. He is also again among the leaders in innings pitched per starts, ranking behind only Max Scherzer (7.4) and Dallas Keuchel (7.2) in that category. The only good reason to keep Cueto off the All-Star roster is that there are too many other outstanding starting pitchers in the league this year, which is largely true. After losing most of the 2013 season to surgery to remove loose bodies from his pitching elbow, Familia emerged as a dominant setup man in the Mets’ bullpen last year and was expected to serve in the same role this year. When closer Jenrry Mejia got hit with an 80-game PED suspension at the end of spring training, however, Famlia was the obvious choice to replace him in the role. Indeed, the 25-year-old has excelled as New York’s closer this season, converting 23 of his 25 save chances and putting up sparkling numbers, playing a key role in keeping the pitching-dependent Mets in the NL playoff hunt. What separates Familia’s performance from similar seasons by non-All-Stars such as Drew Storen and Kenley Jansen is Famlia’s ability to get more than three outs. Famlia’s four multi-inning saves, three of which saw him get five outs, lead the NL, and he has three other multi-inning outings on the year, all of them in Mets wins (though he did blow the save in one of them). The perception that Kershaw hasn’t been as dominant this year as we expect him to be is largely an illusion. He leads the majors in strikeouts (147) and the NL in strikeouts per nine, and with the exception of his home-run rate, which is close to league average, his peripherals are better than his career marks across the board. His 2.54 FIP is the fifth-best in the majors and second-best in the NL (behind Scherzer’s majors-leading 1.93). His deserved run average (a new Baseball Prospectus stat designed to adjust pitching performance to determine how many runs per nine innings a pitcher “deserved” to allow) is 2.62, sixth-best in the NL and better than those of the other two starting pitchers on this ballot, Cueto (2.73) and Carlos Martinez (3.89). 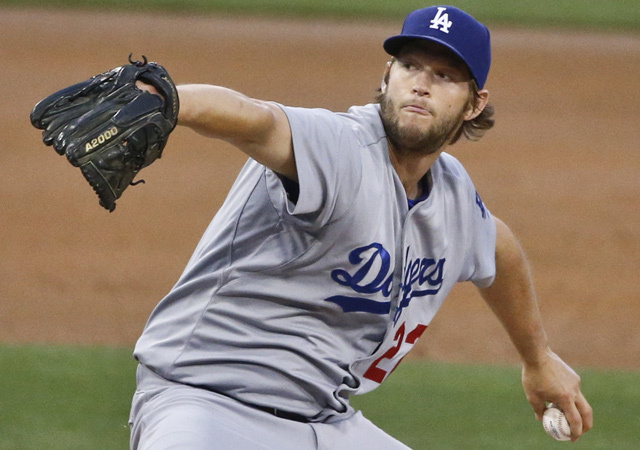 What’s more, despite his lack of wins, Kershaw has been dominating of late. Over his last eight starts, he has posted a 1.78 ERA, 0.83 WHIP, 12.0 K/9, and 6.73 K/BB while averaging seven innings pitched per start. That lends even more support to the suggestion that his 4.32 ERA over his first nine starts was largely a fluke and heavily impacted by factors beyond his control (including a .347 BABIP and some unfriendly ballparks). Martinez, who entered the season with just eight major league starts under his belt, won the Cardinals’ fifth-starter job in camp and has run with it, turning in 13 quality starts in 16 turns, including an active streak of nine straight during which he has gone 6–1 with a 1.35 ERA and averaged 6 2/3 innings per start. The 23-year-old Martinez has been very good this season, but I would put him short of the All-Star team. Jonathan Judge’s DRA figures suggest that Martinez has benefited from above-average catcher framing, yet he has still walked 3.7 men per nine innings (or roughly 10% of the batters he has faced on the season), which is one reason DRA treats him so unfavorably (and that his 3.57 FIP is only slightly better). Given the quality of his competition for this spot, Martinez would have to be the obvious choice in order to get my vote here, and he’s not. The last time Tulowitzki was healthy but not an All-Star was 2009, and he should have been one that season as well (he did finish fifth in the MVP voting). The idea of a healthy Tulowitzki not making the All-Star roster is a confusing one, but it’s not a mistake. Brandon Crawford and Jhonny Peralta, neither of them flashes in the pan, have both been better this year once you factor in ballparks and defense, and both are on the roster, as they should be. The Final Vote ballot is thus an appropriate place for Tulo, whose 119 OPS+ thus far this season is his lowest mark in a season of 50 or more games since 2008. Kershaw, Cueto and Famlia are all having excellent seasons, but I’ll take a starting pitcher over a reliever any day, and I’ll take Kershaw pitching close to the top of his game, which he has been for at least six weeks now, if not longer, over any other pitcher in the game. It hurts to leave out Cueto and it feels weird to leave out Tulowitzki, but this choice is still an easy one.